Going out to dinner with the kids can test the best of parents. Maybe your stars are aligned and everything goes according to plan. But – just in case – it’s always a good idea to have something up your sleeve to keep them busy at the dinner table. 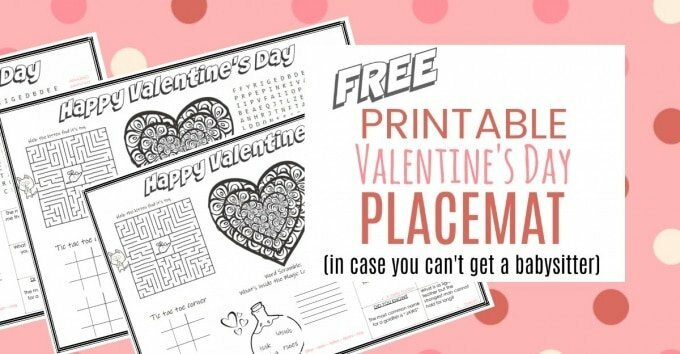 These Valentine’s themed printable place mats will keep the kids entertained, get them laughing and ensure that the whole family has a great night out. My kids go crazy for printable placemats! When we go out to dinner, and the waitress brings out those restaurant printed placemats, my kids beam. And it’s not just the little ones either. Even the teens love them. 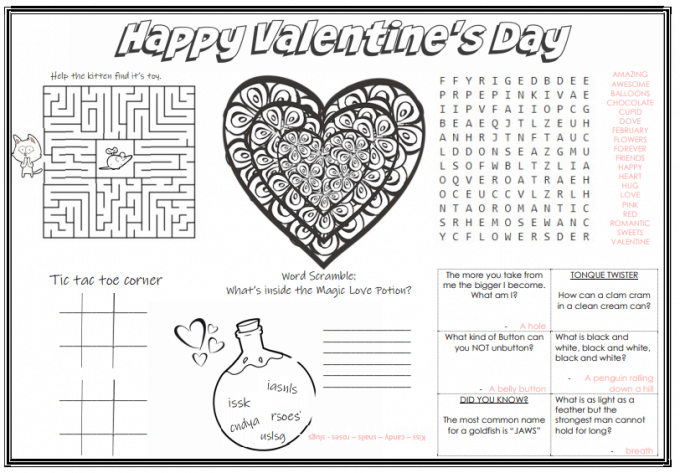 From cheesy jokes, to brain teasers and word puzzles – this all in one Valentine’s activity place mat will keep kids of all ages entertained. Valentine’s Day as a Parent. Once you have kids, the days of carefree nights out together kind of go out the window. A date night with the hubby needs at least two weeks of planning. Arranging a babysitter, planning dinner, praying they don’t have homework or project due and then hoping no-one gets a random tummy bug. Sometimes you actually pull it off. But most of the time in our house we just take our kids with us. I know that the thought of going out to dinner with the kids can send chills down a parents back. It takes military style preparation and a long ‘do’s and don’ts’ discussion in the car on the way there. The secret to a smooth night out with kids is to have something that will keep them entertained. I’m not talking about smart phones either, I’m talking about something they can do at the table that can give them something to do and share with the family. A lot of times kids play up because they feel out of their comfort zone or they’re anxious about the change in their night time routine. It can be a little harder for them if you are going out with other adults. It’s easy for them to feel excluded from the conversation. Activity sheets may seem a little old fashioned but trust me when I say this – try them once and you’ll be hooked! Click HERE or on the picture of the Place mat below and your Activity Sheet will open up in a new window, ready to print or save on your computer for later. Easy. Be sure to Subscribe to my newsletter, like my Facebook page, and follow CEWK on Pinterest for tasty recipes, clean eating tips, and family friendly printables. For more delicious and nutritious recipes from Clean Eating with Kids, check out all our family friendly Clean Eating Recipes here.